I missed the buoy 10 opener... Even though it is traditional for me to be there on the opener, I feel like I will still have more than my fair shot at these fish! The reports I received from many excited voices matched the predictions we have heard of tremendous success. All the way from the Hammond line to 10, limits were common. Approximately 250 boats gathered around Buoy 10, Jim Erickson reported. The ocean was flat calm. "Wish I would have brought my knee board", one very pleased ifisher reported. This is the only reason I feel slightly cheated, as I very rarely enjoy the choppy seas, and even more seldom get to enjoy the flat seas out there! Buoy 10, flat? Ah! Flat calm and a sea full of fish! My fish dream come true! Marty Peterson fished the jaws of the Nehalem and got his clients into a nice king and three silvers (keeping two.) which are coming in on feed runs. Flat calm, he reports, and lots of fish! Marty is now booking for the Columbia and the Nehalem, as are all the guides and charters on ifish. You can't miss this year, guys... If you have been considering a Columbia guided trip, this is the year! Call it a pre Christmas gift, a past birthday gift, or whatever you want, it's worth your time and money to book a Columbia trip this year! A one on one guide trip can help you learn the fishery, and get you into those fish, Guided trips help increase your knowledge of safe river navigation, should you be tempted to try out your own craft on the big Columbia. While you are out with either a guide or a charter, ask questions about safety and navigation. There are some very dangerous areas on the Columbia, and all guides and charters are more than willing to share safety information with you. There is no better year to introduce a loved one to fishing. Take your family, or business group out on a charter. The group experience creates a shared-excitement that is truly contagious! I never cease to enjoy browsing through the pictures of our family trip with Charlton charters. Not only did I learn some great new places to fish, we created some wonderful memories, and met some great people. For purposes of team building, visiting guests from out of town, reward programs, networking, gifts for family or friends, or valued customers, a guided or chartered trip on the Columbia will fit the bill. Keep up to date on the happenings out on the Columbia with the discussion board right here on ifish! This year's Columbia season will go down in history. Get in on the action! Soon we will have an official VHF channel for all "ifishers" to communicate on. I'll post the channel here soon. Watch for ifish decals, out on the boats on the river, identifying our fishing community. These decals are selling like hot cakes, and soon will be gone! Ifish... the community with the edge on big fish, and the latest in news and happenings on Oregon and Washington silvers and kings! You can't get any more up to date information! I've made a promise to myself. If I find one, only one dead cutthroat or steelhead smolt on the bottom of the deepest pool where I fish on the Kilchis, I will have to quit fishing there. One fish hooked too deeply, or one not revived and I quit. I fish barbless, but still the risk is there. I will not allow myself to grab my fly rod and head to the river when I'm up to my ears in work, frustrated by parenting, or tired of cleaning house. Not until the real searun cutthroats appear. Even then, if I were to kill one, I would feel awful. I am deeply protective of this species. Although they make me giggle, I'm not in search of steelhead smolt, or small resident cutts. I am in wait of the large sea runs to begin their procession upstream. One day they will arrive. Most likely after a heavy, late summer rain. Probably when the barometer has bottomed out and is on it's way up. I wake in the quiet of morning, when the light is barely touching the meadow. The clouds hang low, seemingly in an effort to slow down the progression of the sunrise. The late summer field grasses are heavy with rain, battered down in irregular patches, the strongest of stalks fighting to stand tall and failing. The smell of pre-fall hangs in the air and quickens my heartbeat with visions of my favorite chain of piscatorial events. First the arrival of sea run cutthroats. Fall Chinook follows soon after, filling my days with stealth bobbers and gobs of fresh salmon eggs. A short period is then filled with turkey and pumpkin pie while I wait for the river's seasonal finale, the migratory steelhead. I quietly reach for my fly rod from the rack in the office. I sneak out, so that not even the dog hears me. It is time for me to be alone with the river. The bird songs, which so often are muffled by family activity, the raucous crows of roosters, or cars passing on the highway, sounds out like an orchestra warming up before the show. I try an identify the songs by species, but often fail. My footsteps behind me imprint deeply into the just manicured lawn, and my boots kick up droplets of water. Is the ground saturated? Did the river rise? Did the rain bring them in yet? Down the path, which is shrunken by the over growth of summer, a branch slaps me wetly across the face. The river is now visible. My hopes are steeply diminished. The moss on the rocks, exposed by the receding waterline, dried up, and bleached by the sun makes me squint, even in this light. This bright whiteness is still visible on the low water rocks, and tells the story of a river still low and clear. My first cast with a Borden special lands gently behind a rock on the opposite bank. It sinks to quickly produce a strong jolt, but my vision captures the flash of an overly eager smolt. Sometimes I giggle as I pull my fly towards me in a still pool. Whole schools of yearling steelhead follow it close behind. I keep it just ahead of them, playing lead to their march. How hungry and eager these small fish are! Still uneducated to the danger of false food and predatory fishermen! Just as my tomatoes cling green on the vine, the river is not yet ripe. The cutthroat, still in the tidal waters, are feeding on natural food. They go in and out with the tide... waiting, learning to become aware of the dangers that I hold. A rod in one hand, a box of flies in the other. By the time they reach me, they will be less eager, and more cautious of my artificial offerings. I often think, as I throw to a holding fish, that I must pique their interest! But sadly, as they draw nearer for inspection, they turn away, saying, "Nice try, Jen, looked real at first, but you can't fool me!" And thus it was, as I fished the Columbia yesterday. I told the kids it was a for sure "fish on" kind of day. After hearing reports of 2000 fish caught, of how easy it was, of how glasslike and flat the river was, we headed out. How changeable Mother Nature proves herself. A two hour drive down the coast, clad in rain gear for all, (which was readied the night before in a matter of a few chaotic hours). Rods rigged, bait picked up at Tackle Time, we launched our craft. I guess it was the wind waves that turned our faces green. I think perhaps it was the barometer that was still falling. Or by chance it was the wrong tide. But I think, mainly, it was the schools of REAL bait fish that swam around our offerings of swirling herring with hooks dangling out the sides and up two inches. "Nice try, Jennie, Andrew, David and Bill.... but you can't fool us!" I had high hopes of kids changing their minds about the fun of salmon fishing with this non stop action! I had visions of 8 silver salmon sliding around in the fish box! and.... I had visions of cutthroat dancing in my brain this very morning. All is a lesson in patience, I suppose, as I hurriedly get back to the rhythm of working, to finish my projects online, so that I might try the Nehalem for a king later today. "Expect a fish with every cast", I say... and I strive to believe it true and practice this positive attitude. But if I got a fish with every cast, would I not become bored with the sport and the lack of challenge? Thus, I use this saying to spur me back, and away from the negative feelings that a strong dry spell without salmon barbecues can produce. Expect a fish with every cast. But it may be just a yearling steelhead or a mudcat. Cast yet again, upon the waters of hope.. I caught a cold instead of a salmon. I bragged to myself once too often, it appears, about not catching a cold. I haven't had a bad cold in... what, two years? Well, it's got me. I think my immune system is down, and I believe that to be due to not enough fish caught. You think I am joking? I'm not! I think that a real weakness in the immune system sets in when "the skunk" hits a person. Countless days of getting up, razzed to catch a fish, feeling up, feeling fishy and positive, followed by the subsequent downer of coming home fishless. It takes a toll on the body. You can only take so much of, "My it was a pretty day!" and "It's just as much fun to watch you land a fish!" or, "The worst day fishing is better than the best day at work." I have taken an emotional angler's beating. I have been fishless, unless you count cutthroats, dollies and lake trout, since the Spring Chinook fishery. Nada steelie, nada silver, nada chinook. Nada one take down that makes my rod arch, my reel scream, and my heart beat fast enough to clean out any virus or bacteria that may be pulsing through my veins. I did take a chinook out of the Kenai, but it was not truly mine. It was caught on someone else's rod. Although they didn't touch it when it went down, and shoved me towards it, it wasn't really MY fish. I think that catch delayed my oncoming sickness, and gave me an immunity boost, but it didn't last for long. I'm sick, I have a fever of 102 and yet I still long to fish. I'm going to wrap myself up in blankets, if I have to, and sit it out. In the boat. I need to take a chinook, put it in my fish box and keep fishing until I see two. Ish.... I wish a fish, bigtime now! I was really sick yesterday, so my doc said to go to ER. Good thing, as I have pneumonia it seems. O.K., O.K., so it is antibiotics and 2 fish in the box. Then I'll be better. The ifish discussion board is experiencing extremely high server load at this time. You may not be able to access it at this time. I may have to upgrade to a new server. Please be patient as these matters are being contemplated. Well, if this isn't a sign of the times. Andrew made a bookmarked list of birthday ideas for himself. Hmmm. Yet another year passed me by without our 56 year tradition of going to Diamond Lake with my family. No slivers in my feet while padding to the souvenir store for penny candies. No campfires at night where we all gather to talk quietly by the lake. No hiking to the abandoned fish hatchery on the dusty trails, while viewing the grandeur of Mt. Thielson and Mt. Bailey. They stand, face to face with each other, looking over the lake. The rest of my family went, I just can't afford it anymore. Cabins are 150.00 a night. Wow! And they don't even have electric curtains! These cabins are not luxury accommodations. I feel sad about stopping our tradition, but there is really nothing I can do about it. I listen to the adventures after the week's end, on the telephone with my sister. She recounted a story that had me giggling until I was coughing so hard I had to hang up. They went for pizza, as tradition has it, one night of the week. While waiting for an order, the waitress asked, "Where are you staying?" "The cabins." My sister answered. "Oh! You look like cabin people!" What do cabin people look like? The guess was the cabin people look unlike camping people, or motel people, or through traffic people... Snotty, rich people? Is that what she meant? So, on the way to the lodge for a drink one night, my brother chose one entrance, as my sister was heading through another entrance. "Oh!" She shouted across the parking lot. "You are going that way?" With his quick wit, my brother replied, "Yip, cabin people this way, camping people that way!" After meeting for a drink, the whole gang headed out the door, only to find that the way my brother had gone, was locked for the night. OH NO! The cabin people entry was locked!!! My brother in law, poking fun at the whole cabin people/camping people drama, put his coat over his head, and proceeded down the stairs in mocked embarrassment through the "camping people's" entrance. They have fun, at Diamond Lake, and I wish I'd have gone. But would my extended family pretend they didn't know me, as I proceed to register at the campgrounds? Maybe some day, I too, will be "cabin people". Skippity doo dah, off to the Tillamook County Fair. Had a lovely time in Portland, and I have a tale to tell of fishing with Bev and Dot. I rarely say to people, "You should be a guide", but by golly, to these girls, I said just that! They had me so lined in on where I was to stay, what I needed to bring, phone numbers, addresses, times, etc., that organization was easy for me! My lure box for salmon and steelhead sits half empty on the shelf in the garage. It was with both wonder and envy that I gazed inside these girls Flatfish and Kwikfish boxes. One said Bev, the other said Dot. Every size, every color of every fish catchin' lure was displayed neatly, all freshly 'O ringed' and 'treble hooked', all razor sharpened for a jaw stinging hook set. They picked me up promptly at 4:30 A.M. The 16 foot Smoker Craft was packed with every type of everything you need! Every food you can imagine, salty, sweet, healthy and not healthy! A small pharmacy, a potty poncho so shore breaks didn't occur, and even recyclable toilet paper! A net on the end of a pole was available for retrieving lost lures and other interesting floating objects. Two oars, neatly stowed, seats secured down for the trip with bunji cords, a custom made boat top that protected us from the sun. Squared away. This is fishing with Bev and Dot. Stopping in the prep lane, we readied our gear for launch. Bev expertly dropped the boat in the water and Dot took over from there. The four stroke Mercury in purring condition carried us merrily out of Chinook Landing. Soon Captain Bev was navigating our position and Dot was at the bow ready to drop anchor. "A little to the left, a little forward, drop!" We let out the sea anchor and found ourselves smoothly in line with the one other early bird that set the days line. After a short synopsis of our goals and how to achieve them, I followed their instruction and began learning their methodology. Alright, I have to tell you. I have a skunk going. However, their comes a time when it starts grating on you like a dull ache. You laugh when people mention it, but there is a gnawing in your soul. It hits you hard, and through my laughter there comes frustration. It's a mystery. Why am I not catching fish? Is it just me? Is there some super human force that I need to repel? What have I been doing differently? I think back to any cosmetics that I am using that I could change, or perhaps I AM holding my jaw wrong!. Or is it my attitude? Am I fishing paranoid, do they know I am doubtful? Whatever it is, it is. All I know is that we, totally prepared and experienced, were skunked. I'm talking we, the entire line of fishermen. The girls said it was unusually slow. They had been catching all week. Seems, through a believable set of familiar circumstance, that the minute our boat pulled out, giving up at noon, the hog line began producing fish. Now give me a break. I mean a fish break, guys. I am the skunk, right? I am the cause and the power and the glory for no fish all morning? Amen. REALLY? Man, I have to learn to re channel this power that I seem to have over these fish. They did! Phone call after phone call reported they caught fish all afternoon! It could be the tide, it could be just an afternoon bite. It could be my lipstick. But it could be just me and some negative fish repelling aura. It's gotta change, and now I can't clean house, I can't write columns, I can't think, nor eat, nor play. I have to change my skunk streak and that's all I can do. Last week while fishing with Andrew, David and Bill, Andrew thought he'd play a joke on Bill. I still haven't told him, and my hope is that he doesn't read this. Andrew heard it was a 'for sure' fish on day. He put a banana in his pocket and he thought he would limit out, and then eat the banana casually, pretending ignorance on the trip back to the dock. He wanted to see Bill's reaction. Half way through the trip, with no bites, I saw a banana float past the boat. I glanced at Andrew. He nodded that it was his. For two days after, the bite was off at Buoy 10. Was the lone banana that Andrew polluted the river with responsible? Bobbing helplessly amongst the waves, deterring the bite for all? Yikes! I'm not superstitious and neither is Andrew... But sometimes you just have to wonder. Do not fish any where near the red Alumaweld super vee out at Buoy 10 today. I have got the skunk and it seems to be catching. Of course, in the dim hope that I start catching, would you be the first to congratulate me? I need the attention! Somehow, in my heart of hearts, I am dreaming of coming home and posting a pic of me and a big chinook! Heck, I'd be happy to even post one of Bill and a big one! That would be a start!
" Death Of A Skunk"
What a day on the Columbia! Whee! For more info, read on the discussion board this topic! Yesterday, we put in at Hammond, cruised around the Oregon side for about a half hour and took out. It was just to windy and choppy, and not pleasurable trying to keep the boat in line, trolling. We left to fish the Nehalem. 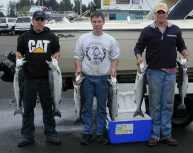 At the Hammond takeout, we took this picture of these fine young men and their limit of silvers, taken from the ocean. Shown are Jared Busch, Bobby Lokken, and Rich Davis, all from Oregon. 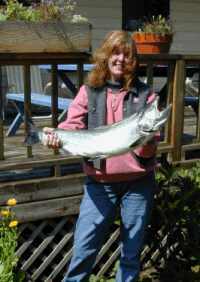 The winners page has a great picture of a recent Nehalem catch. The fishing is picking up at the jaws! We fished the bay all afternoon, and fish were rolling everywhere, including almost in our boat! We couldn't get them to take though, trying herring, spinners, and even a wrapped Kwikfish! It was a lovely day on the bay, though. Very relaxing. I have a new respect for guides. Bill had me run the boat. The whole dang thing. From jetting into place to running the trolling motor. It was a great feeling to know I can do everything, but I'll tell ya... I have one hand on the tiller, the other hand trying to find bottom with my rod. Holding both, he asks me if I want a doughnut. Fighting the wind to stay in the channel, I glanced at both busy hands and turned to him with an open mouth. If I can't even eat a doughnut, how do you re bait 4 clients, keep in the channel, tell jokes when the fishing is slow and net fish? They can have it! I told him, I find it much more relaxing when he operates the boat. DUH! Stan Fagerstrom, our dedicated and wonderful Master Caster is now writing articles at Mack's Lures web site. Bass enthusiasts can learn much from this expert, and I hope you take the time to go take a gander. I feel like I have taken two weeks of Prozac! I really believe that not catching fish is a major source of depression and since my hot day on Monday, I feel like a new girl! Whee! The pressure is off, and the day on the Nehalem, fish or no fish, was the most pleasant day I can remember in a long time. The sun was shining, the birds were singing, and fish were jumping everywhere! I love this time of year! Take care, and make sure and come to the ifish bbq, on September 8th! Ouch! I have been doing heavy duty cleaning around this house, and my whole body aches. It's the "Jane Fonda Housecleaning Workout". I don't know what has gotten into me. Perhaps it was looking under David's bed and finding a half of a PBJ that had been there for months. Uh oh! I haven't been a Mom for a while! I have been in Alaska fishing, the house, the house, the house! Also, in the miscellaneous assorted food department, stowed neatly under the bed, were 2 forks, three spoons, 2 pop cans, 4 glasses, a dead bird the cats left, a half eaten corn on the cob, sporting bird feathers and growing some interesting black fur mold that melded into the carpet fibers. I have a lost sock bag, and I found some of the matches for them mixed in with his stuffed animals, and one on the window ledge so neatly wadded that I had mistaken for a baseball. Various clothing articles were twisted and wet from swimming in the river, and mixed in with the clean clothes. His room is like a toilet I can't flush. Andrew's room was cleaner, but we threw away assorted papers and doo dads that one day he loved and the next day he lost interest in. Now, with all my internet work caught up, (I think! ), David's room cleaned and sanitized, my wood floors freshly mopped with Murphy's, 2 full size garbage bags of rip rap out of Andrew's room, I am ready, once again, to hit the rivers. I was sent this prayer last night from Kenneth Gudeman, and it meant a lot to me. I kind of giggled, but it's so true! So far today God, I've done all right. I haven't been grumpy, nasty, or selfish. I'm really glad of that. But in a few minutes, Lord, I'm going to get out of bed, and from then on, I'm probably going to need a lot of help. So, with that in mind, I head toward the launch ramps. Please, seriously, though... Say a prayer for our fire fighters today, OK? I'm thinking that she lies there, still and barely moving, thinking that she's dying. She has a slow, low, flow. Bare white rocks are exposed and collecting sunshine for the first time in years. She's listening, and I think she hears it coming... death is certain this time, with this record low water. "There are salmon on their way up here, and I have no water to carry them." She sounds desperate and hoarse. Never has she been so close to death. It is late summer, and all around her things are turning to a dull brown. It is the time of year when death whispers through the dry breeze. Tall trees surrounding her, drop the first sediment of dying leaves. They join the dusty sediment blown from the beaches and swirl lazily in the slow deeper pockets. They barely move. The river shows every sign of dying. Along with the other forms of flora and fauna, that once, not long ago, promised life eternal with new overgrowth. The Spring, which brought bright green moss to the few rocks exposed in the deep current, danced the dance of all creation. I spent the evening trying to convince her. I lay my fly rod in the rocks. I had tried to use a fly in the shallow riffles to summon a trout. To show her that indeed, she still carried life. But embarrassingly, I failed. The river was still and quiet. My fly, useless. I bent to my knees, at the rivers edge and spoke. I told her of rains that would come to fill her banks. I told her of the large salmon that would come to visit her very soon. "First, my dear river, we will have short bursts of rain, and your cutthroat will come to see you." I reached out to touch the slimy mosses that lay still between the dried rocks. "This moss will be washed away soon and you will feel fresh and clean again." I shivered at a burst of wind and the coolness of the air. The nights are getting cool, do you feel it? Do you remember? It happens every year!" She listened. I know she did. As I spoke I began to see small fish surface in the pool above me. "After the cutthroat, we will get heavier rains, and strong winds, storms... remember? The salmon will come home to you! Soon they will fill those deep pools! I pointed. ... "and then run through your riffles and spawn around the bend, just like they did last year." I forced my sore legs to a stand and began to walk away. As I turned, my eyes caught a glimpse of a cutthroat that had enjoyed my persuasive speech. He came clear out of the water, and landed, creating a ripple that stretched all the way across the still water. The Kilchis could convince you, from observation, that it is dying... It's eerily quiet and breathes a breath of near death. In the Fall, the rivers seasons are reversed. It is then that my river comes alive. You wake one morning and the screen has been wiped clean. You can feel it in your bones, and see it as you open your eyes. So many days in a row of bright blue sky, or even brightly lit clouds and fog are absent. A heavy blanket of ominous clouds lies instead, over the valley, and presses you tightly under your covers. There is no rain yet, but the smell in the air tells that it is close by and could arrive any second. The first taste of fall. The tease of winter, the dark, the gloom, the rain, the wind, the cold floors in the kitchen. The fish.... They're coming, ladies and gentlemen. All of them. I'm putting on my sweats and building a fire. It has come to my realization that I'd rather talk to my bunnies and chickens then to talk to some people. The rain was magnificent, and I enjoyed every soggy moment of it. Now the rivers are up, the fishing should be getting better and I am having a garage sale. Wait a minute! Someone, quick, run this for me while I go fishing. Whose idea was this anyway? The story about Ermie Walters in The Daily Oregonian touched me deeply. Although I don't think I have ever met Ermie, I couldn't help but think that I should have. Or perhaps even had met him, somewhere along one of the rivers. Have you? I read the story, back then, and the following comments on the Ifish Discussion Board about him. Still, the image I had of him popped up in my mind quite frequently. Yesterday I was excited to receive this in my e mail. ...would like to invite all who have met Ermie Walters over his many years of sport fishing to a boat launch/park dedication in his honor on Sept.22, at 2 P.M., at river mile 19.4 on Alsea hwy. 34. A great chance to meet one of Oregon's true pioneers, and say thanks for his contributions to steelhead fishing in Oregon. You should check out Brian Meehan's story about him in The Daily Oregonian (steelhead beware) 7/27/01. We will be having a park clean up at the site this weekend to get prepared. Please help me get the word out about the dedication/bbq. Hope for a huge turnout. Many of Oregon's top guides will be attending. Thanks much. Jim Wilson. I wrote back to Jim, telling him I'd never met him, can I still go? He said YES! So.... You can bet where I'll be on September 22nd. I'm going to print out the nice things you all wrote about him and give him a copy. There are some people I'd rather speak to than my bunnies and chickens. I have a feeling Ermie is one of them! When slicing a sandwich in two, (with a distinct sawing motion) place the knife blade facing downwards toward the sandwich. This enables you to cut the sandwich in two instead of your hand. I was supposed to crawl up a ladder to remove some staples from the wall. I eyed it suspiciously, and called for Andrew. Nope, not going to even try that. Have a garage sale! They are so danged fun! It's the hardest I have worked for years! Four solid days of work, four pounds lost, and I earned the equivalent of perhaps four hours of work sitting at the computer. At the end of the sale, I loaded all the leftover treasures in the trailer and took them to the local charity. For some strange reason, they didn't accept all of my offerings. "You don't want this broken reel?" I can think of good things though. You are supposed to apply pressure to a cut such as mine to stop the bleeding. I can't bandage it too well, but it is precisely where I hold my reel with my left hand. My reel acts as a bandage and perfectly applies pressure as I reel in a 40 pound salmon! Neat, huh?!? Ish! It's starting to ooze, so it is time now to head off to Buoy 10. I'm going to have to catch alot of salmon to get this bleeding to stop. Three fish worth just won't do. Wonder if I can apply for a medical excuse to exceed my limit? I wouldn't want to bleed to death, you know. Yes... another great idea, brought to you by ifish.net! I can back trailers into six lane, busy boat launches with the best of em! This is still stressful though, at Hammond! The last thing that I thought would happen yesterday at the church hole is that we'd get skunked, but we did! We started out fishing positive, as several hook ups were noted around us, but Bill started getting anxious 10 minutes into the 'no bite'. I encouraged him to hang on, but within a half hour we were both asking ourselves.... "What are we doing wrong????" The answer, of course, was nothing! Pretty soon that failure feeling crept into the boat and if nothing else, we weren't catching due to bad attitudes! We cooked some fresh salmon the other night with Tuttle's Smoked Fish Seasoning and Magic Barbecue Rub. I can't wait to try it with other BBQ treats! It is really wonderful! Welcome to ifish, Tuttle's Bait Company! A handy place to get your bait in Seaview Washington! The location worked out really well when we put the boat in at Chinook last week. We met some great people there, and the bait was excellent! Tuttle's is now listed under Top Bait and Tackle in the left hand column, of the front page at ifish.net. I will be doing a "Ready Set" contest on The Discussion Board and giving away a box of their Rub and Grub. We smoked some fish with it also, and it turned out super! You've got to try a box or two! Have a great day! I'm off to Portland to shop for the boys school clothes, and look at a new used car for me. All of the white summer bleaching of rocks is gone with the recession of the recent high water on the Kilchis River. The water is clear again, but seemingly devoid of any life. I threw every fly I had into the water last night and didn't see a rise, nor feel any life! Oh well.... They'll be back! Ifishstock 2001 is coming right up on September 8th. It's the annual ifish family bbq! Please write to me if you want further information with -- ifishstock -- in the header. I'll put you on the information list. The discussion board also contains information, and the whole ifish crew is invited! Please let me know if you want a seat in a boat, or have extra boat seats available to share. I also need to know where you are planning to stay, and if I should order up a porta potty. I thought I had a lot of time, but MAN! It's a week and a half away! Bill is out with some kind of rented contraption to mow the field so we can park people's boats. Poor guy! It's 4 feet tall and I see him out there now, struggling with the machine. I'm going to go out and help soon. I need to do some hard physical labor to clear my mind. Let's get going on this party thing. I have a feeling it's going to be a really fun time! Yesterday, Bill and I used a contraption called the "Billy Goat", a self propelled field mower, to take our wild and overgrown meadow down from four feet, to four inches. It was a world in itself. I had thought the whole field dead and devoid of life. As I followed behind this huge grass eating monster, field mice scattered from in front of it, racing to relocate their homes. I was fascinated, and sad. I wondered what kind of birds lay their nests in tall fields. I wondered how many homes I had disturbed. I thought of the huge forests that are clear cut, and how many animals lose their homes. I thought that I was no better for doing this. I felt powerful, with this huge motor in front of me, and small and ashamed. I allowed this once neatly mowed meadow to become wild again. I invited critters to make their homes here, and to make them believe they were safe. Then I rented this huge home eating monster and took it all away. Call me silly. As they skittered about looking to relocate, I once again thought of the book I am reading, one savored chapter at a time. A new David James Duncan book. For years, I could say without hesitation, that my favorite all time book was "The River Why". I have found a new favorite. My Story as Told by Water: Confessions, Druidic Rants, Reflections, Bird-Watchings, Fish-Stalkings, Visions, Songs and Prayers Refracting Light, by David James Duncan... once again! You can order it above, or go to the books page on ifish. I can't talk about it yet. I'm still swimming in thought on it, and can only tell you, that I am overwhelmed by the experience. I can hardly advance chapters, but to stop and read paragraph after paragraph aloud to Bill. I think that perhaps I am disturbing his T.V. viewing, but I can't help it. "Permission to speak?" I continually interrupt. "You have to listen to this!" "Ever felt this way?" "BILL! LISTEN!" "Law and Order" just doesn't grab me! I feel about life, about development and preservation very similar to what the author does. It sticks with me, as I go through my day, (mowing little mouse homes...) looking at things quite differently, or quite the same, but without stopping to consider. I love my newly mowed field, and I think that most of the field mice are still alive. My cats, however, have discovered their vulnerable homeless state. As I padded bare foot from bed to sink this morning, I stepped on something still warm and squishy. You have got to get this book! You just have to! I can't describe it yet. I am still too involved in it. In the right pocket of my fly fishing vest is a gift from my son, Andrew. The first dried maple leaf from the tree that overhangs the deepest hole on the Kilchis. He knows me well. He knows that this is the perfect gift to give to a girl that repeatedly and excitedly speaks about the coming of fall. He wandered down to the river to ask me a question the other night. "Can I install linux on the old computer?" He got his answer from me, and stalled around, head down, searching for treasures. "I don't want to leave, Mom." No explanation was given. He didn't want to admit it was nice there. Computers call him, not nature. He wouldn't admit it. Not a chance. My computer age kid understands my love for the river occasionally. He lingered for a while, gave me the leaf, and left. Must be strange, as a kid, to have a Mother who plays a role so opposite of his feelings. He is looking at the end of long, lazy sunny days, and dreading the start of school. He knows that I celebrate Fall each year, by gathering leaves and bringing them indoors. I fill bowls with orange, reds, and yellows. Decorating table tops with these leaves, candles, select rocks and sticks I pick up from the river. In between computer tasks, I run around with more energy than a spring chicken. Cleaning house, pruning tomato plants, throwing away old toys, cleaning drawers and tackle boxes. It is the great Fall cleanup, or an exchange of sorts. I take all the garbage out of the house, and bring the outdoors in. Every days end, in the last week, I have treasured the quiet crisp air of night. I gently remove my fly rod from the office rack. My two fishing cats join me as I walk the quiet stream dancing a fly through the riffles. Too lazy to reel in my line in the dead sections of river, I blindly flip my line upstream, my feet stumbling over the rocks, making my way towards the big pool at the head of our property. It's good practice. It's called flip and trip. As dusk hits, I make my way back home. I have a deck outside my upstairs bedroom that overlooks the river. With my new James Duncan book, my binoculars, and an old wooden chair, I then sit and wait for fall to happen. I listen for the nightly flight of a lone heron that trecks down the river. It's awkward squawk echoes against the canyon walls. Two nights ago, I was startled by the sound of the forest exploding across the river. Sticks breaking, rocks tumbling down to the water. Huge splashes disturbed the river. I looked through the trees to find three elk crossing the river just as night fell. Their power and size held me still as I strained my eyes through the binoculars. Did I really see that? When it's too dark to read, I wander in to bed. I snuggle between my new flannel sheets, and choruses of coyotes lull me to sleep. It's 5:30 A.M. and the roosters are crowing. School shopping today. Although I've promised new clothes, and fresh paper and pens, it is still not much of a gift for Andrew and David. I do think it helps ease their summer losses, though, to have me excited. It's a non stop parade of fishing festivities from now till Spring. Forget fresh cut roses. Give me a dried maple leaf, anyday. Page webbed by Jennie If you would like a professional web page, contact me!